W. Duke, Son & Co. 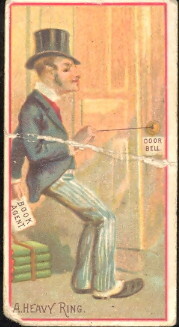 Issued this popular set around 1890, The cards measure 1-7/16" X 2-3/4" and there are 50 in the series. A series of humorous drawings produced by Duke. The humor of today is quite different than it was over 100 years ago, so some of it has been lost over time. 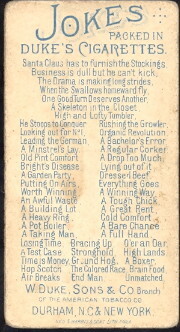 The backs have the title of the series and a non-alphabetic checklist and an ad for W. Duke, sons & Co.